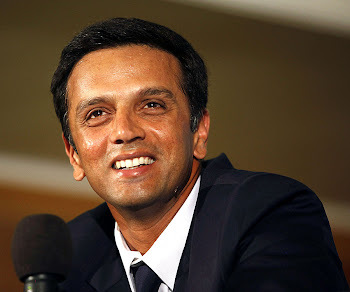 Out-of-form Rahul Dravid on Sunday got support from unexpected quarters with Australia coach Tim Nielsen backing the former India captain to get out of the lean patch soon. Nielsen said Dravid's poor form was compounded by the fact that he got out to good balls in the ongoing series against Australia. "I think Rahul has had one of those series where he seems to have got quite a few good balls. Every time he has nicked the ball, it has gone straight to the keeper or slips and they have caught it. One jumped a bit in the first innings (in the Test here) and he gloved it straight to short leg," Nielsen said. "He is just having a bit of a rut at the moment where it seems as though he is a low spot as far as scoring runs and not having a lot of luck. It's interesting. He has been training hard," Nielsen added. Dravid's poor run in the series in which he has aggregated just 120 runs from seven innings with a lone fifty in it has raised question marks about his continued presence in the team when the two-Test series against England commences next month at Ahmedabad. "We often see him down the nets when we are there having a session by himself and working hard. I know the quality of player that he is, I am sure he will make a lot of runs in the future. It was just his turn to have a bit of a dry spot this series and he will come back hard," Nielsen elaborated. Nielsen pointed out that the other Indian batsmen have made up for Dravid's indifferent form. "But his team has made up for it by scoring a lot of runs around him," he added.